Vienna, Austria has a fantastic restaurant scene! Leading up to our trip, we read that until about a decade ago, Austrian cuisine hadn’t innovated in generations. However, we found a lot of variety in the Austrian capital. Cantinetta Antinori – This place tops our list for best meal in Vienna, and it wasn’t Viennese. Owned by the Antinori family, the large, white tablecloth restaurant serves wines and olive oil from the family vineyards in Tuscany (which are also exported worldwide). The Tuscan soup and cannelloni were flavorful highlights. I had the medaglioni (filet with rocket salad, topped with pecorino cheese), which just melted in my mouth. This splurge dinner was Euro 90.40 and included a bottle of wine. Cantinetta La Norma – The hole-in-the-wall Italian restaurant just off Franziskanerplatz in old town Vienna is tiny. Since it only has 8 tables, you get lots of individualized attention, if not legroom. We each had a glass of the Montelpuciano wine, which was a robust portion for only Euro 3. Laura’s mushroom pizza was good, but my gnocchi with gorgonzola sauce was an explosion of flavors. For Euro 38, it was a remarkably good value, however, given how small the restaurant is, reservations are critical. Restaurant zum Scherer (CLOSED) – This small pub-like restaurant off Judenplatz served up generous portions of traditional Viennese cuisine and was filled mostly with locals. I started with a salad and it was nice to add some vegetables to the diet of heavy foods. I had the daily special – a meatball with lentils and potatoes. Laura had the steak with potatoes. All was very good and the server was really nice to us. Cost was Euro 46.30. Note: This restaurant is now closed. Freshii – This is a really quick, healthy lunch spot right near the Hofburg on Herrengasse, or you can take your lunch away and eat it on a bench within the Hofburg complex area. For just Euro 18.66, the cost of just one entree back at fancy café on the corner, I had the Budda’s Satay with chicken (noodles), while Laura had the Fiesta Salad. If you chose to dine in, you get the bonus of free WiFi. Despite being a chain restaurant (locations in eight countries), this is a great option in the middle of town near the touristic sites. Tokori in the Naschmarkt (CLOSED) – The Naschmarkt is a two-block long outdoor market. The market has parallel rows of vendors are each flanked by the main road. The stalls sell everything from cheese and wine to fish and meats – it’s an entire grocery store. Many of the stalls are also mini-restaurants. We ate the Tokori pan-Asian restaurant (the sign outside says Asia Time). 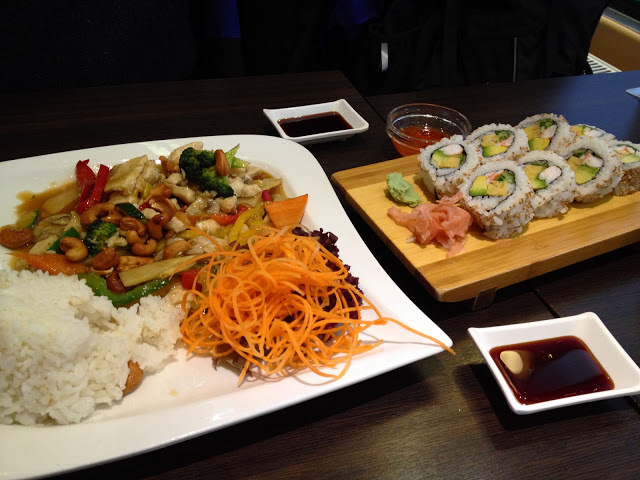 We had the spring rolls, California maki rolls and cashew chicken. It was excellent! (For more information, read Lunchtime at the Naschmarkt in Vienna) Note: This location of Tokori has closed, but there is another location in Vienna if you want to visit. Trzesniewski – Legions swear by this small café in the city centre which serves small open-faced sandwiches with various toppings. The establishment has been doing a booming business since it was founded by a Polish immigrant, Franciszek Trzesniewski, back in 1902. Each little sandwich costs only €1, so we tried a couple different ones (deviled egg, cucumber-egg and a bacon and egg). They also serve small glasses of wine to accompany the sandwiches. By our tastes, Trzesniewski was more of a snack. 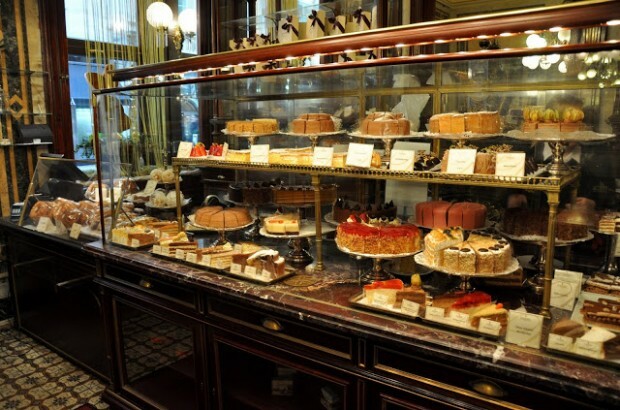 Café Demel – This quintessential Austrian café serves the amazing desserts that everyone in Vienna craves. However, it can also be a good breakfast spot since they serve breakfast until noon. We each had scrambled eggs with sausage, along with that strong Viennese coffee. The highlight of our breakfast was the apple strudel. Yes, we had apple strudel for breakfast. Demel was extremely busy on the weekend, but we found it a pleasant experience on a weekday morning. As a bonus, there is free entertainment if you sit in the back along the glass wall, where we were able to watch the pastry chefs make their delightful, intricate desserts. 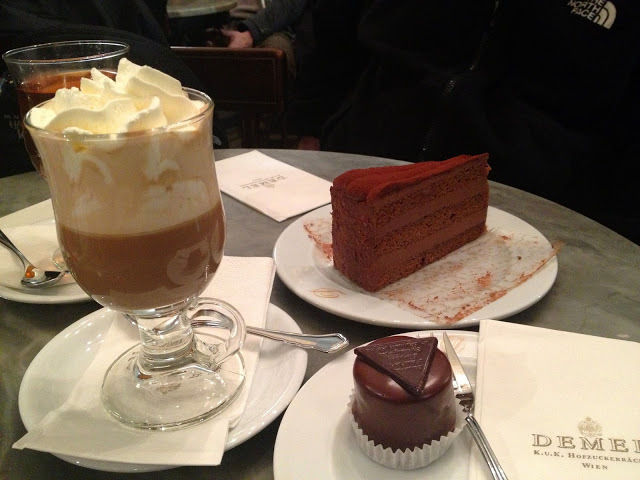 Demel is a great Viennese experience! 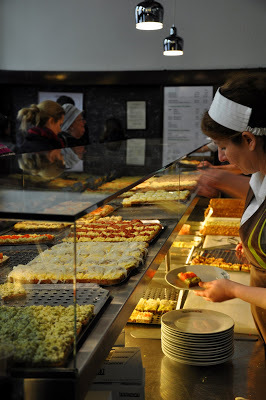 If you’ve been to Vienna, what is your favorite restaurant? What do you think about Seven Great Restaurants in Vienna, Austria? And it was great meeting you at TBEX! Thanks Adam! Great to meet you this weekend as well. Looking forward to hearing more news out of flyover country.